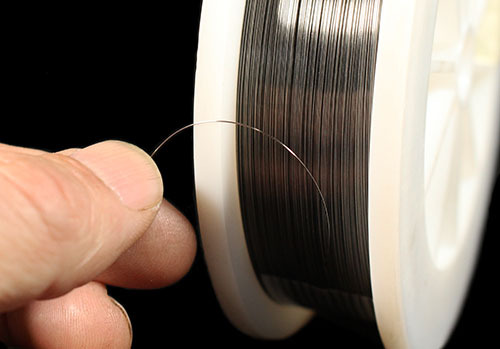 Tungsten Metal Wire, 99.95% purity. 0.01" (0.25 mm) diameter x 16' (4.88 m) long roll. Tungsten has the highest melting temperature of all metals, 6192 °F (3422 °C). It has excellent corrosion resistance and is only slightly affected by acids. Because of these properties, it is frequently used as electrodes in high-energy electrical equipment where other metals would vaporize or melt. The thin filaments in incandescent light bulbs are made of Tungsten wire. Supplied on a small plastic spool.